Suzanne – Available for Adoption! 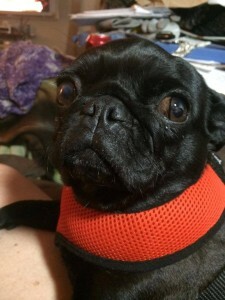 Suzanne is a 4 year old small black pug. She is a very nervous pug and will take some to warm up to strangers. She is working on potty training, but like most puppy mill dogs, it’s taking some time and patience. Suzanne has discovered toys and has a stuffed bunny as her favorite. We will update more information about Suzanne as she comes out of her shell and adapts to a life outside the cage.